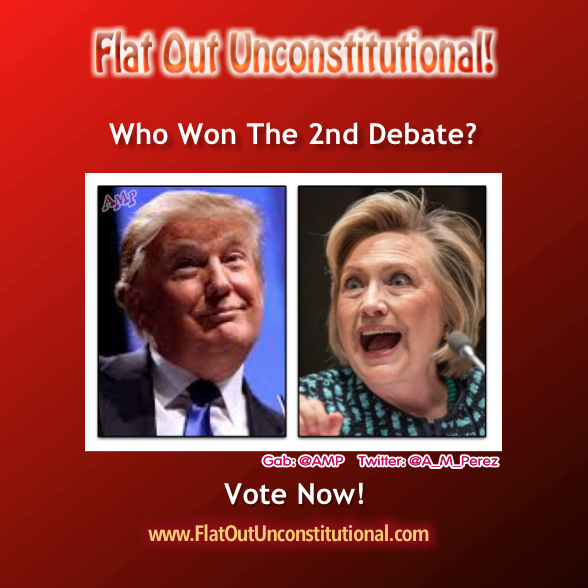 Who Won the Second Debate? Vote! Previous Twitter Support Caught in Web of Deception! Next Trump Won! No More Compromises! Hillary is a smooth talker and obviously more experienced in politics, which I think gives her an advantage in the debates. Way too much time and attention was given to the “locker room talk”, while of course Hillary got a free pass for all of her and her husband’s transgressions. I think Trump held his ground though, and hopefully will prevail in the end. I know it is an evil thought, but I kept feeling like someone should have slapped Hillary’s face when she put on that sappy grin every time Trump attacked her. Does that make me a deplorable abuser of women? Or will the thought police protect me because I am a woman? Hillary is counting on the Perot effect. She knows that got them into the White House the first time. Who do you think will be Hillary’s SCOTUS choice? There are only two choices in this race. Hillary or not Hillary. And to be honest, we have two candidates that are so old and decrepit, that it is quite possible and hopeful that the real race is between Pence and Kaine. Who do you want as President? Pence or Kaine? That is something to decide. There are no other contenders. A wasted vote for some third party moron isn’t going to do anything but give Hillary/Kaine your vote. I support Donald Trump is unwavering Hillary the American people why she committed 33000 felonious Acts of Treason. Along with her 2 top advisors. Her grandchildren should know her as a convict talking between glass. Chelsea needs a stripted jump suit of her own. He stopped the bleeding. One more like this and he might turn the ship 🚢 around. 1. Trump. 2. Hillary 3. The American People in that order.